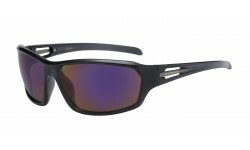 SunrayzzImports Wholesale Sunglasses offers the highest quality of ARCTIC BLUE sunglasses. Feel free to compare and browse our selection of Discount ARCTIC BLUE Wholesale Sunglasses. Don't waste your time selling cheap quality, wholesale sunglasses, our top quality sunglasses will have you Saving Big & Selling More! Arctic Blue There are 13 products. Sporty and functional, these Arctic Blue sunglasses are perfect for the men with an active lifestyle. Order by the dozen and get up to 20% off. Semi frameless sport shades from the Arctic Blue brand. 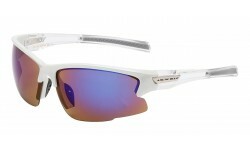 These sunglasses are excellent for functional wear such as playing outdoor sports. Retailers with a market for active men should carry these shades. Arctic Blue Sunglasses with soft rubber nose pads for maximum comfort. A definite must-have for retailers and sunglasses resellers looking to carry quality sunglasses for men. Inspired by the iconic wayfarer style, these Arctic Blue casual sunglasses offers a comfortable fit while looking ultra stylish! Comes with blue ice tech specialty lens. Order by the dozen and get discounts up to 20% off! New aviator sunglasses with the Arctic Blue lens! Double bridge and metal hinges for a sturdy made product. This new Arctic Blue sport wrap around style is perfect for people who want shades that are a comfortable fit while being active. Whether you're hiking or playing sports, these sunglasses in bulk are a hot seller! New Arctic Blue metal shades! Similar to the iconic aviators, but more of a squarish shape. This is a top selling brand made with good quality materials for discount sunglasses in bulk. New top quality style from the Arctic Blue brand! This is a metal frameless item with adjustable nose pads. The shape of the lens is rectangular/square and is one of the most popular shapes we wll. A definite must have for retailers. This Arctic Blue style is best used for outdoor sporting activities like softball, golfing, volleyball, and biking.The revo lenses come in a blue tint and looks really cool while offering UV protection. Arctic Blue continues to produce quality designs and this style is a prime example.